There is something about the local folks here and their utmost hatred for the seat belt. In the past, drivers would only buckle up when they get onto the highway as non-compliance warrants a hefty fine if caught. However, once you are off the highway, the traffic police turn a blind eye, even though the traffic rules stipulate that seat belt be fastened as long as you are on the road, regardless if it is highway or local. Problem is when modern cars, the car will ding ding ding all the way as long as your seat belt is not fastened. So one of the genius chauffeurs in the company car fleet decided to go buy a spare buckle to plug in, just so that the ding dings will go away. Things that make you go "Hmm....."
Seat belt saves lives. What I don't get is why the adverse attitude toward seat belt? It is not like it is uncomfortable. 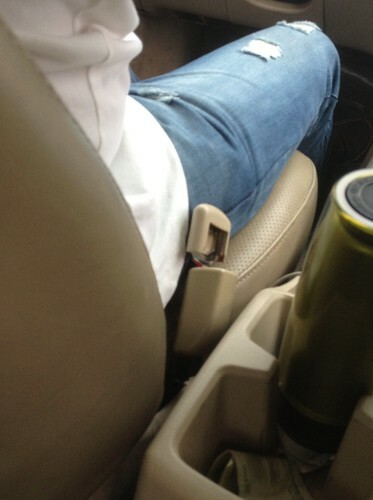 In fact, I hardly notice the seat belt after a while. Even IF it is uncomfortable, I still think buckling up is a good idea. Definitely, no argument there. Driving is a risky activity no matter how much of an expert you are. We are looking forward to your contribution.Do also let your fellow bloggers know about this initiative. They can pledge via the URL above. I have broken traffic rules many times. I always forget tying up the seat belt. After that my father asked me to join Arena driving lessons. They helped me a lot in learning the basics of driving. After that I have not been caught yet.